Cufon fonts dissapearing in IE9? So, you have your own WordPress site, and you are using some theme you got of the internet. You upgrade to Internet Explorer 9, and bam, all your page headings dissapear. I had this exact issue on this site, as the theme I use generates the post hears using Cufon. It’s not a WordPress issue, and this could happen with any site that uses Cufon. 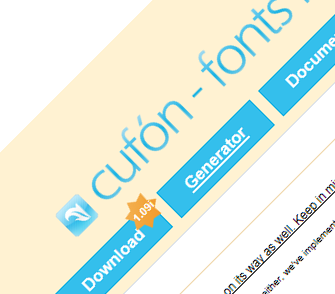 Thankfully it’s as simple as upgrading to the latest version of the cufon-yui.js file, which you can download by clicking here or visiting the Cufon home page at http://cufon.shoqolate.com and clicking the ‘Download’ button. Then simply upload to your site and all will be fixed (of course you’ll take a backup of the existing file just in case though, won’t you?). Just got a big headache sorted mate. Thanks a Zillion. U are a super star.